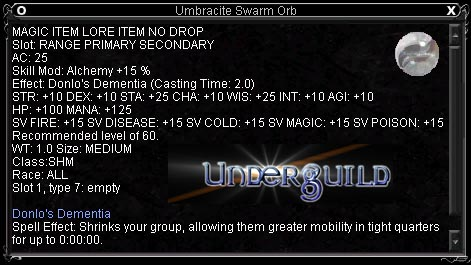 actual name is "Umbracite Swarm Orb"
wrong name also in the screen shot then ? This orb also has a 15% Alchemy modifier. 2 sec casting time and no buff symbol now for info. Spell cast on you: You feel smaller. Spell cast on someone: Soandso shrinks. Spell fades: You return to normal height. work? eh? whats work when you draw lines for a living? Despite the random stuff in this spdat parsing, this spell is Group Shrink. Was it a level 60 shaman in your server's most uber guild? sigh you dont need to be in a servers most uber guild. Only 2 or 3 guilds do VT on my server right now, and theres about 6 guilds past us into time and god who have thrown away all vt loot or never even went.